Of course, for an American expatriate, such cross-cultural creativity can be intriguing and — very often — much tastier than what we’re offered back in the States, but sometimes — let’s be honest — it’s just bizarre. 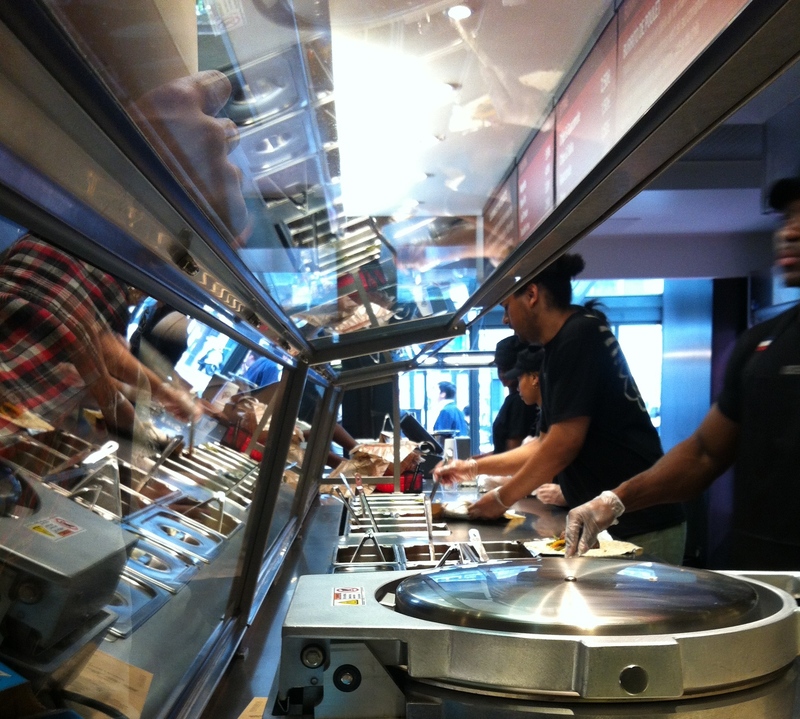 So, it was with a tiny bit of trepidation that I ventured out yesterday to order my first Chipotle burrito in Paris. Would it be just like they are back home, or would I find Camembert or something in there when I took my first bite? We arrived just before 2 p.m., and there was still a rather long line, stretching almost out the front door. So much for waiting out the lunch crowd. Thankfully, the line moved quickly, but the short wait did give me an opportunity to settle in, soak in the ambiance, and get a feel for how “at home” I was. I have to say, with the exception of the French menu, it felt remarkably like being back in the States, especially given that a good quarter of the people in line were chattering away in English. Even the staff (who were uncharacteristically warm and inviting for a Parisian establishment) were all bilingual, shifting with ease from French to English according to their customers’ needs, and they even carried on a Franglais conversation with me as I ordered my vegetarian fajita burrito. So, how was the food? Well, as I’d hoped, it was pretty much spot on. The rice was a bit different — not as bleached white and fluffy as the rice you get at the Chipotles back home. Maybe that’s because the French don’t use rice that’s been GMO’ed into “food magazine photo” quality. Maybe it had gotten a little overcooked in the chafing pan. Who knows? In any case, the peppers and onions, medium salsa, cheese and guacamole had just the flavors I expected … and were just what my American taste buds had been craving since the day before. And, oh yeah, no Camembert. Whew! At least the flavor was right. I mean, Chipotle really does make a mean guacamole, and those chips with lime juice and kosher salt are always top notch. But, yeah, there is that one other, tiny downside: THE PRICE. 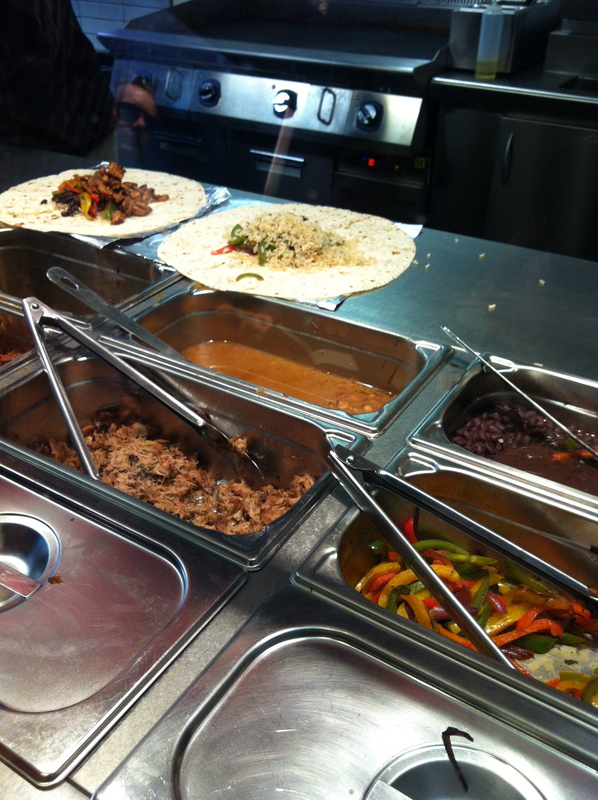 All burritos, tacos, and salads are 9 € each, which translates to almost $12. Add to that just one order of chips and guac, two beers (at 4,50 € a pop) or two margaritas (yes, you can get those here for 5,50 €), and you’re looking at a fast food lunch tab for two coming in at almost $40. 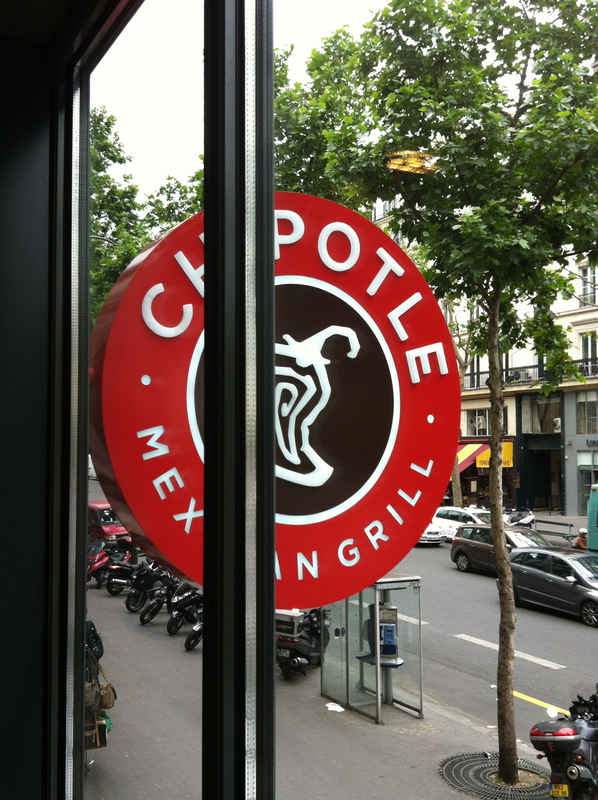 My recommendation: get two orders of chips and guac and BYOB, or better yet, BYO … C.
All in all, lunch at Chipotle Paris was a success. 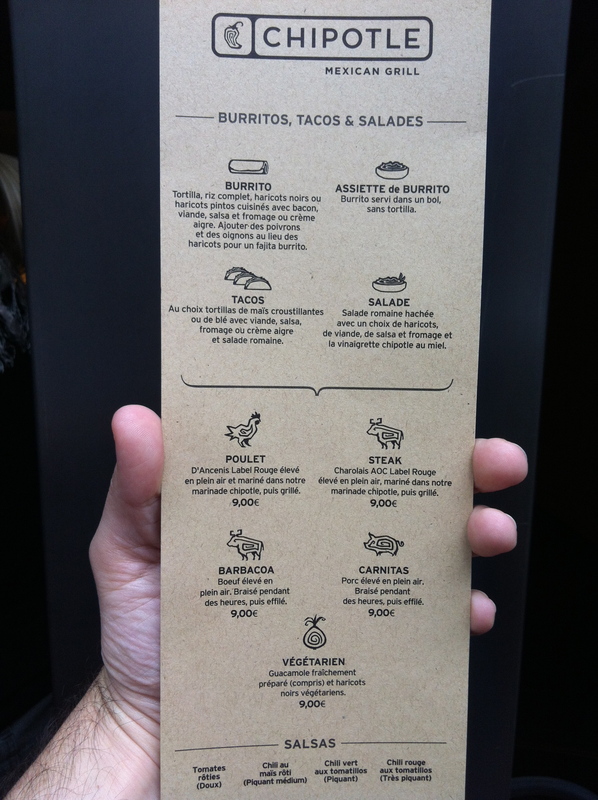 A blogger friend of mine alerted me, though, to the presence of yet another Mexican fast food joint in Paris called Cactus. 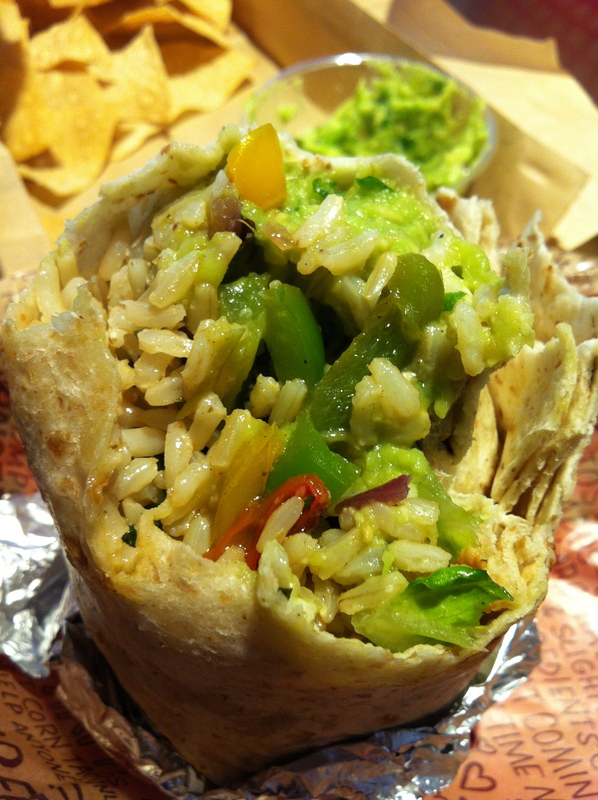 I checked out their website today, and it looks remarkably Chipotle-like right down to the cilantro-lime rice. I may go on a recon mission to Cactus to see if it’s any easier on my wallet. 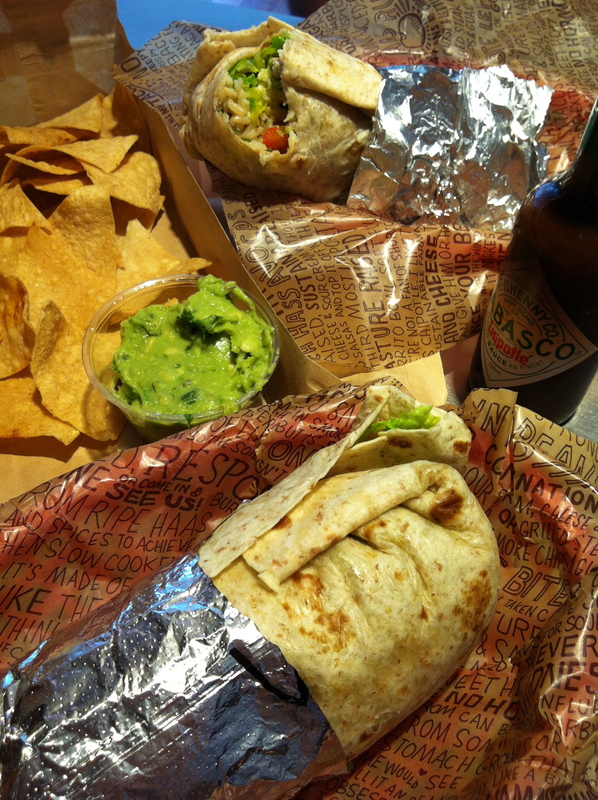 In the meantime, though, Chipotle’s earned a spot on my occasional American lunch list. Bon appétit! … uh … ¡Buen provecho! P.S. — Right after posting this to Facebook, I got a nice comment from someone I assume works on Chipotle’s Facebook page: “Thanks for the review. If you haven’t been in the States for some time, all of our restaurants now offer brown rice too instead of just the white – we’ve ditched the white overseas. As for the chips, it looked like we made a mistake – next time if that happens, take them back please and let our folks know – they’ll fix that right up. – Joe” So, there you have it! Brown rice! 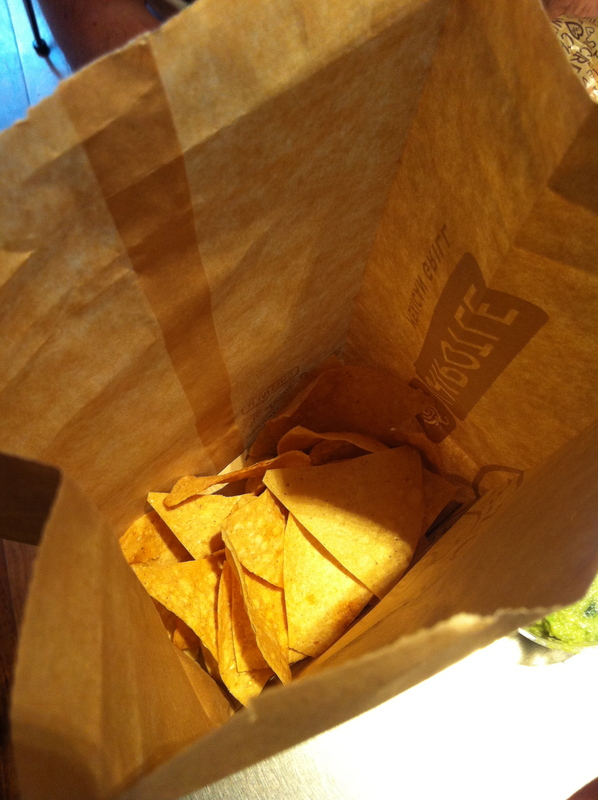 And, more importantly … more chips! ← Oh Happy Day … Guacamole in Paris! Great review. Albeit the prices are a bit high, they are adjusted in every major city. Worth it though, IMO. Thanks for the compliment! Yeah, the prices are pretty standard for Paris. It’s just another vestige of the sticker-shock that I can’t get over as an American in Paris, especially for things like burritos, you know? Not that it’ll stop me from going back! FYI…. Chipotle is not owned by McDonalds…. That was many years ago and was simply a McDonalds investment they have since divested from…It is a wholly public and self governed company… You should check the facts first. Thanks for the information, Matt, but you know you can be just as helpful without the attitude. And I, for one, deeply regret being the one to have given you that egregious misinformation in the first place. Interesting fact:(that I checked) Egregious may be defined as “shockingly bad” or “remarkably good.” Perhaps you initially thought it “shockingly bad” that Chipotle was owned by McDo’s. Or maybe you thought Chipotle had “remarkably good” food despite the “shockingly bad” idea that it was owned by Mickey D’s. Whatever the case, you still do not have a Mr. B’s in Paris which is where I expect to be Monday afternoon. Bon appetit, fatback! Anyway, you make me laugh. Mr. B’s! How DOES one say “fatback” in French? About the small amount of tortilla chips, please remind that “chipoter” in french means “to quibble” or “to be a fussy eater”… that allows you to say : “chez Chipotle, on chipote sur les chips !” Bon appétit ! 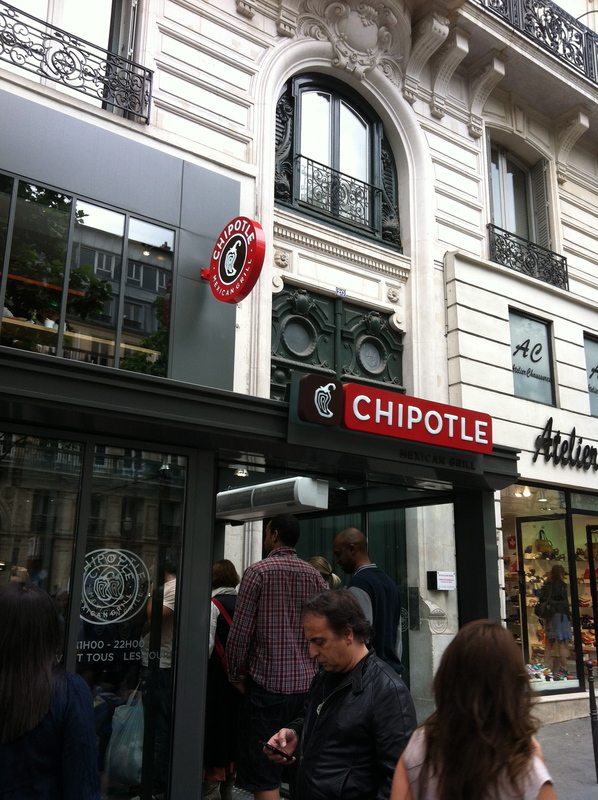 I had no idea that there was a Chipotle in Paris. But 9 euros for a burrito?? Non, merçi. I tried it too during the summer and was sorely disappointed. I’d never go back for that price and the taste wasn’t any better than what I’ve figured out how to make at home now.